The U.S. entry into World War II is one of the issues that American political culture considers to be settled and not discussable. This was not the case in the run up to the war. One group of writers and intellectuals, who led a mass movement, opposed entry into the war. And not because they liked Hitler or otherwise. Those people who opposed it had their careers and even lives run over by the war machine, but does that mean that we have nothing to learn from them? So few of their writings are around that it is hard to tell. So in many ways, we need to be grateful to Bruce Ramsey, who has put together the writings of the most brilliant and prolific of the anti-war writers. They are by Garet Garrett, the novelist and opponent of the New Deal. He wrote for the Saturday Evening Post, one of the largest circulation periodicals in the country. In editorials from 1939 to 1942, he laid out the rationale for staying out of Europe's war. As Ramsey points out in the introduction, the issues that we think about today were not issues then. There is little talk of Japan or the fate of European Jews. These were not the concerns of the war party. The real question was whether the U.S. ought to intervene in yet another European conflict that would inevitably have the U.S. linking arms with the Soviet Union. From Garrett's point of view, American security was not really at stake. He predicted that an intervention would lead to a further loss of freedom at home, a bolstering of the Soviet dictatorship, a massive debt burden, an entrenchment of the executive state – all of which came true. Garrett saw these costs of war like few others and he made his views known. These writings, then, are rare in our times when no one wants to think about the ways in which U.S. entry into the war sealed the "revolution within the form" that the New Deal represented. Garrett predicted that after we vanquished Nazism, we would have a further problem to deal with namely, the Soviet problem ("Having saved the world from Nazism, should we not be morally obligated to go on and save it from Bolshevism?"). He was right in every way. This collection draws attention to the myriad ways in which U.S. involvement in the war began long before Pearl Harbor. FDR had been preparing the ground for war by abandoning American neutrality and assisting Britain in the war effort – all without approval from Congress and with very little knowledge by the American people. The tactics were an extension of those established during the 1930s. "As it leads the country to war, saying it will keep it out, it tells you only what it thinks it will be good for you to know, and cannot always afford to tell you the truth, because you may not have been enough accustomed to the idea. As, for example, when the news was out that your Government was negotiating with Great Britain for air and navy bases on the fringe of this hemisphere, it told you that this had nothing whatever to do with the fifty destroyers for which the British had put forth a great propaganda in this country. Simply, that was not so." These days nearly everyone says that the "good war" was worth the fighting but does that mean that the critics had nothing to say worth hearing? Garrett would say that this is the attitude we find in imperial dictatorships, not free countries. In many ways, then, this volume is a monument to the kind of critical thinking that freedom breeds and protects. 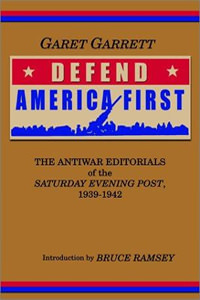 Defend America First is the perfect title of this collection of articles written by Garet Garrett. But the subtitle--The AntiWar Editorials of the Saturday Evening Post, 1939-1942--can be misleading. Mr. Garrett was not an antiwar pacifist in any sense. He criticized President Roosevelt (FDR) for not spending enough to build not only the best navy in the world but two--one for each coast; and he even supported conscription. When we look back today at the "good war" and "the greatest generation," we are blinded to what was going on in America before Pearl Harbor and before the shocking discoveries of the concentration camps. There was another war going on right here in America--a war against our Constitution and against the very economic system that made this country so great and which was being challenged by European socialism. We have never yet fully recovered from those lost battles and most citizens today are completely unaware. Garrett was not only a very capable writer, but also a rational-thinking economist and patriotic historian. He understood the principals of our founders and their fear of the tendency toward centralization of political power. When fighting to make the world safe for "democracy," Garrett would have us ask first, what kind of democracy? `Totalitarian Democracy' and `Elective Despotism' are a couple of the thought-provoking terms I picked up from reading these articles. Garrett also scrutinizes terms and phrases used by the Roosevelt administration (such as "methods short of war") to lure the American people into an undeclared war against the consent of the governed while simultaneously provoking our enemies abroad. This collection of articles is invaluable because of the fact that they were public and contemporary documents rather than the revisionist retrospections we have been taught ever since. How ironic that the greatest immorality of the attack on Pearl Harbor is always considered to be the fact that the attack occurred before a declaration of war. Garrett had been writing for well over a year that our president, with the complicity of an inept congress, had in fact been waging an undeclared war against Germany and Japan even though at the time we were woefully unprepared for it and that we elected our leaders based on promises to keep us out of it. Nevertheless, once the war was inevitably upon us, long before Pearl Harbor, Garrett was 100% behind the effort for victory and knew that Americans, of all the peoples of the world, would be well up to the task.